The acute brain injury research program of the University of Cambridge Division of Anaesthesia has aimed to understand regional cerebral pathophysiology to advance the care of critically ill patients after brain injury, from initial ictus, through recovery from coma and rehabilitation, to final outcome. These aims have been realized through a series of MRC Program and Cooperative Group Grants, based in the Wolfson Brain Imaging Centre (WBIC), which have formed a focus for productive collaboration with other departments in the Clinical School, and the broader neuroscience community in Cambridge. Substantial academic leadership for this research program has come from the Division of Anaesthesia, but key collaborations have included NHS colleagues in the Neurocritical Care Unit, the University Departments of Neurosurgery, Psychiatry, and the MRC Cognition and Brain Sciences Unit. The WBIC houses two separate instruments for human brain imaging, a positron emission tomography (PET) camera and two 3 Tesla magnetic resonance imaging (MRI) system. Along with advances in imaging techniques, the research program in the Division has also supported and benefited from the maturation of a multimodality bedside monitoring programme, with implementation of microdialysis, neurochemistry and mathematical modeling initiatives. This clinical research is underpinned by a program of experimental research in acute brain injury based at the Cambridge Brain Repair Centre (BRC), which is described below. The BRC provides excellent facilities for stem cell biology and access to the only quantitative animal PET system (microPET) in the UK. However, it is important to emphasise that the expertise, facilities and collaborative opportunities provided by acute brain injury program have also allowed us to develop other areas of research. 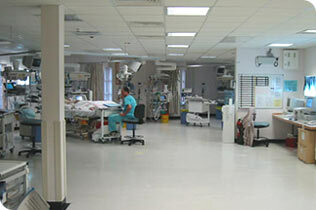 Central to the success of the brain injury programme has been the establishment of a 21 bed, state-of-the-art Neurosciences Critical Care Unit (NCCU), adjacent to the WBIC. Protocol driven management has facilitated research, with clear evidence of mutual benefit for research and clinical care imperatives. The collaboration with the NHS Department in Cambridge provides added value by ensuring a close and productive interaction between clinical service delivery and research. Equally importantly, we have substantial support from referring hospitals in the region, with close adherence to formal transfer protocols, and regionally funded audits of head injury care and of transfer policies and process. Finally, the overall quality of research is greatly improved by the acquisition of high quality outcome data, which is undertaken within the context of the NCCU follow up clinic, which is the only one of its kind in the UK. The imaging programme in acute brain injury is based on clinical studies in brain trauma and subarachnoid haemorrhage, which have addressed the central role of abnormal cerebrovascular physiology in the injured brain. We have published numerous papers in this area since the year 2000. Some of these have delivered key methodological advances, which have allowed the use of modern imaging tools in this setting. Others have enunciated key pathophysiological concepts that have changed the way we look at neurocritical care in these conditions. Finally, we have used the methodological advances to better understand pathophysiology in brain injury. Thus, we have developed methodologies to quantify distributed ischaemia in the injured brain using 15O-PET and used these to unequivocally demonstrate, for the first time, that true ischaemia does occur in the context of head injury. Combining these imaging techniques with novel bedside monitoring tools such as tissue oxygen monitoring has allowed us to identify microvascular dysfunction as a mechanism that increases oxygen diffusion barriers.Such microvascular ischaemia is responsible for a perfusion-utilisation mismatch in the brain, and is now recognised to be an important cause of tissue hypoxia, and is part of a novel conceptualisation of the “traumatic penumbra”, which represents the portion of brain at risk and amenable to therapy. A rigorous analysis of the test-retest capabilities of PET has allowed us to employ it as a tool to study the impact of a variety of therapeutic interventions on cerebrovascular physiology. These studies have allowed us to define the dangers of some commonly used therapies across patient populations, while highlighting inter-individual variations in benefits from others. Perhaps most importantly, we have not confined our research to the acute phase. The NCCU follow up clinic has allowed us to acquire high quality outcome data, and recruit patients to studies in the recovery phase. These studies allow us to relate acute physiology (which we manipulate) to eventual outcome, and provide new (and sometimes surprising) insights. For example, we have recently shown that the cognitive deficits seen after head injury are best related not to focal sites of injury, but to dysfunction of specific (particularly cholinergic) neurotransmitter systems. These have raised important pathophysiological questions regarding the mechanisms of specific cholinergic vulnerability, and suggested new avenues of therapy, both in the acute and chronic phase.